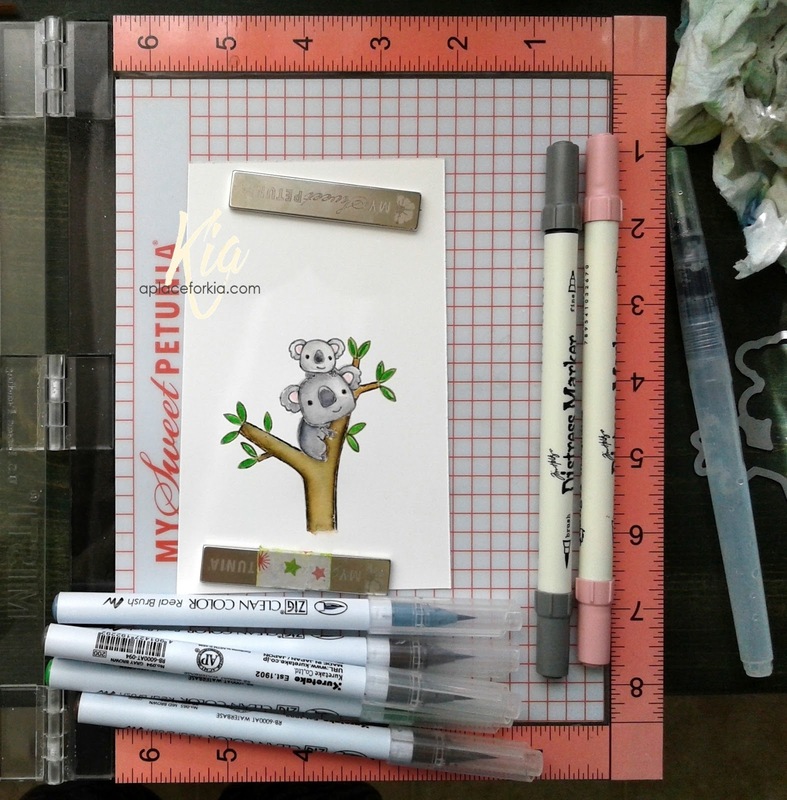 It has been a very long time since I have used my colour pencils, and as I needed to make two Easter cards I thought I would use my pencils and also colour on a grey paper, something else I have never done. 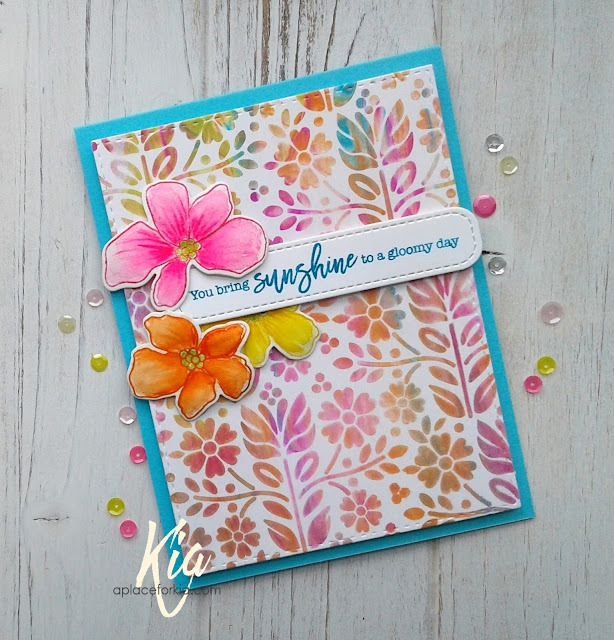 And, what better way to play than with this new Showers and Flowers stamp set by Simon Says Stamp. The one thing I found with the pencils is even with several layers, I feel it is not as vibrant as I would like. I do note that it would be brighter done on white cardstock ... next time! This is done using Zig brushes, and the vibrancy is noticeable. I am probably biased, but I do love watercolour and find it so much easier to get the colours the way I would like them to be. 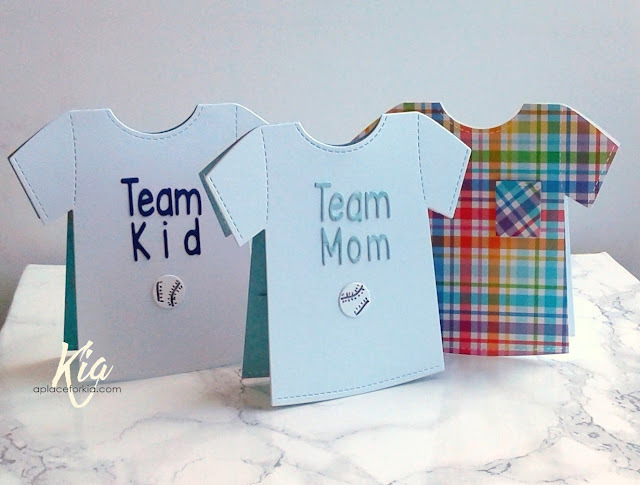 Both cards have the panel attached to the card base using fun foam and both have Nuvo Jewel drops used. Products: Neenah Classic Crest Solar White Cardstock, Neenah Antique Grey Cardstock, Aura Factory Yellow Cardstock, Simon Says Stamp Showers and Flowers Stamp Set, Simon Says Stamp Easter Greetings Stamp Set, Simon Says Stamp Stitched Rectangles Die Set, MFT Die-Namics Inside Out Diagonal Stitched Rectangle STAX Die Set, Prismacolor Premier Color Pencils Spring Green, Limepeel, Kelly Green, Olive Green, Blush Pink, Pink, Magenta, White, Canary Yellow, Yellow Ochre, Odourless Blending Solution, Chocolate, Light Umber, Burnt Ochre, Blue Slate, Non-Photo Blue, Cloud Blue, Zig Brushes Pale Green, Light Green, May Green, Yellow, Bright Yellow, Pink, Mid Brown, Light Blue, Shadow Blue, Fun Foam, Nuvo Jewel Drops. I am not fussed on colouring people images. If I must, I tend to prefer silhouettes. However this image was a gift some time ago, and this is the first time I have inked her up. I started by stamping in black ink suitable for watercolour as I was painting with my Zig brushes and a paint brush. They are perfect to use for images such as this. Once I completed the colouring, I die cut the image using my deckled oval die, and attached her to my card base using foam tape. 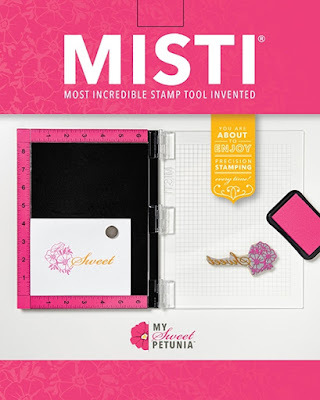 In my Misti I stamped my sentiment, then finished with a few Nuvo Jewel drops. Considered the elite hair for watercolour, Escoda selects only the best Kolinsky male sable hair for this brush. This hair comes from the Tajmyr region in very northern Siberia. Points perfectly and has an extraordinary capacity to retain liquids. Also, the review I read are all most favourable. To try these brushes out I ordered the Escoda-Reserva-Kolinsky-Tajmyr series-1212 in #8. It is with this brush that I painted the above image. I always lay my colour down in a paint dish or on my craft mat and pick it up with a wet brush to colour. The tip of these brushes allow me to get in even the smallest of spaces, yet for larger pieces they hold water and paint perfectly, and the body of the brush is very comfortable to hold. 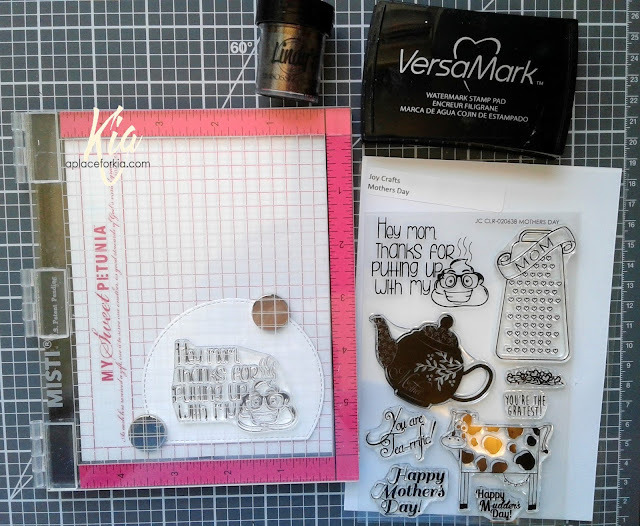 Products: Unity Stamps Be Present, Simon Says Stamp Flower Friend, Frantic Stamper Deckled Ovals Die Set, Simon Says Stamp Intense Black Ink, Zig Brushes, Aura Cardstock, Foam Tape, Nuvo Jewel Drops. 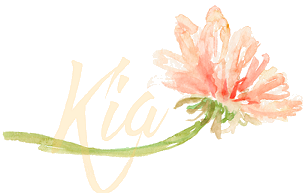 Spring is on the way, making this the perfect time for a blog hop. 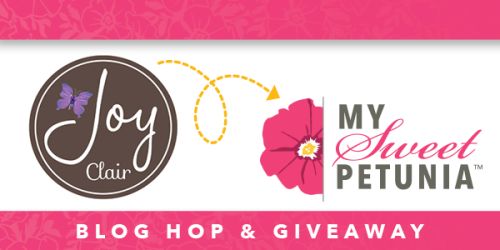 Today, My Sweet Petunia is hopping with the delightful Pink and Main. 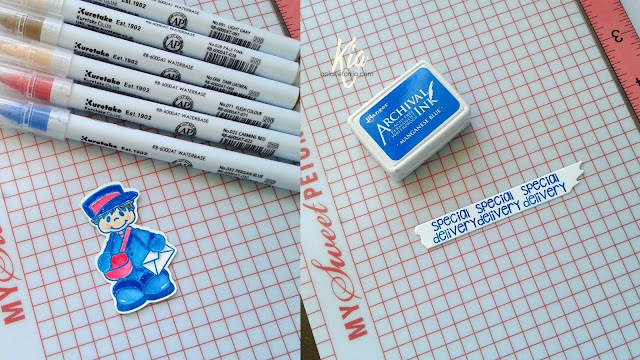 And yes, we have prizes. Two lucky commenters from the hop will win one of two prizes: a $50.00 shopping spree at My Sweet Petunia and a $50.00 shopping spree at Pink and Main! 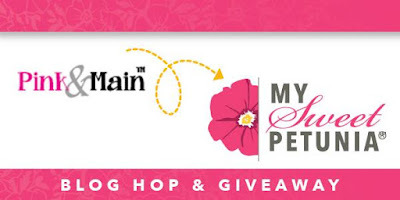 Leave your comments no later than Sunday, April 1st, at 11:59 PM Central time and winners will be announced on Tuesday April 3rd, on the Pink and Main and My Sweet Petunia blogs. 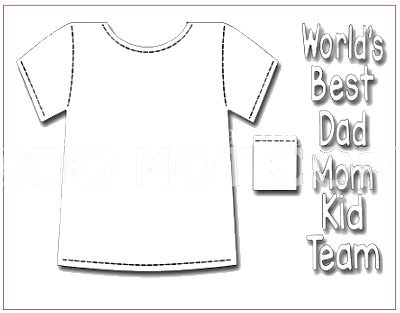 So be sure to visit everyone in the hop where you will find great ideas and inspiration. For my first card today I used my Original Misti as well as my Mini Misti and the ever adorable Happy Mail Stamp Set. 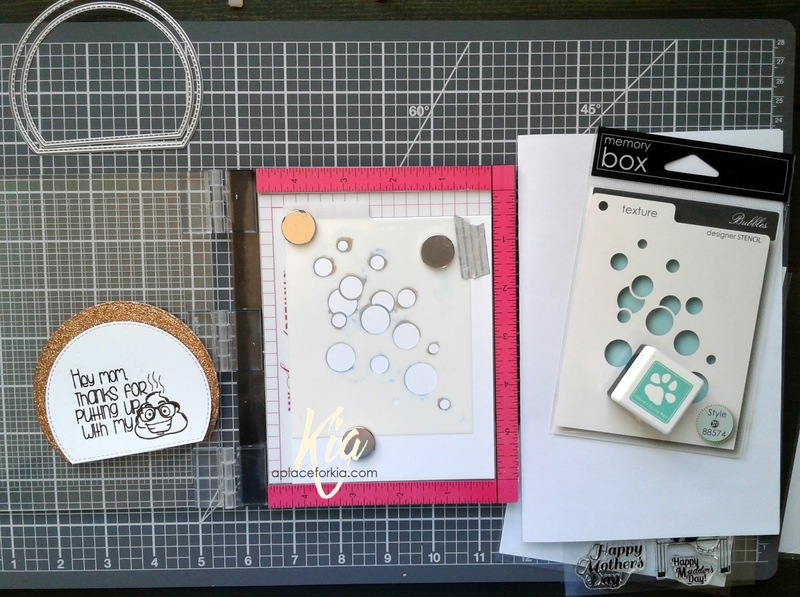 I started by stamping my die cut panel with the snail, butterfly and hearts included in the set and heat embossing with clear embossing powder. To watercolour my background I used Tim Holtz Distress Inks in Broken China, Salty Ocean, Mermaid Lagoon, Peacock Feathers and Blueprint Sketch, adding several layers of colour and drying in between each. 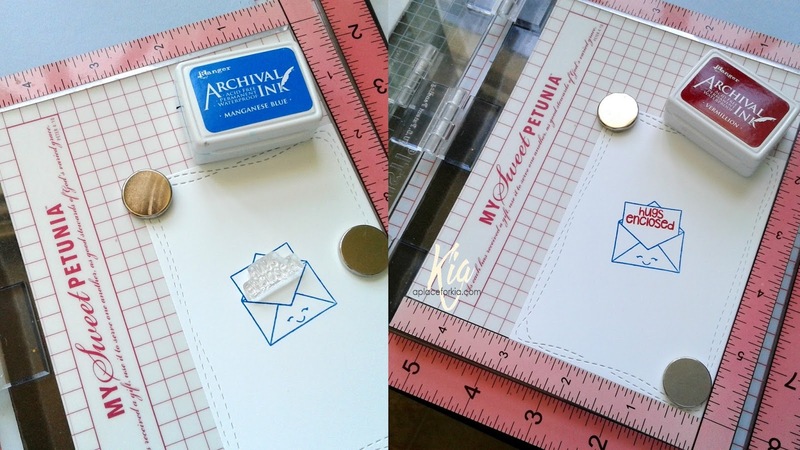 I stamped the little letter carrier using Ranger Archival Ink in Manganese Blue and heat embossed with clear embossing powder, then cut out. I also stamped the sentiment using the same ink colour and die cut for the front of my card. 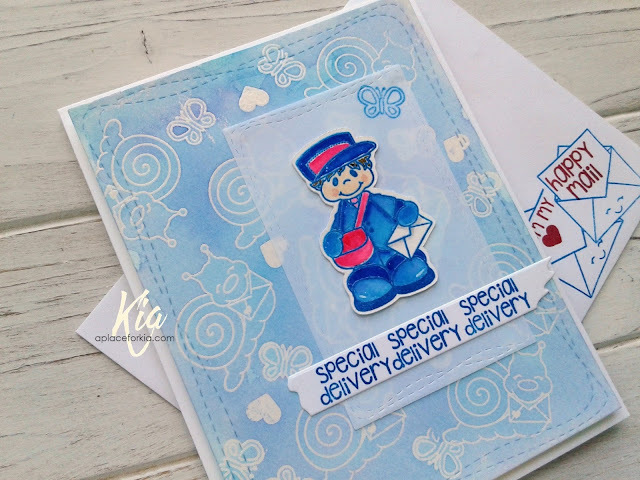 For the inside I stamped the open envelope, again using the Manganese Blue, then stamped the sentiment using Vermilion Ink. 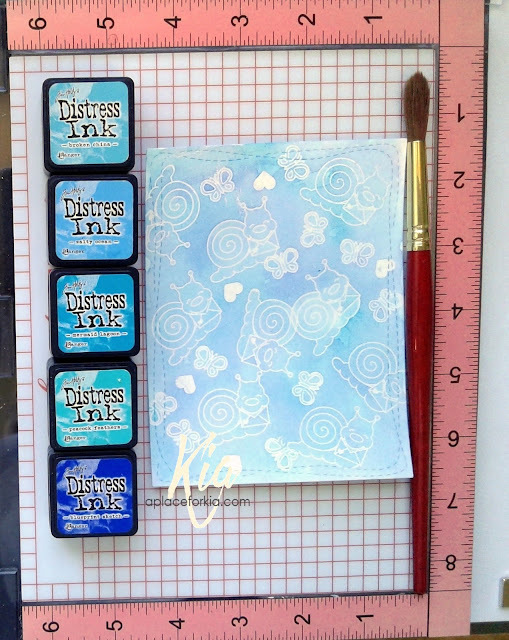 Not shown here are the 2 butterflies I also stamped in the blue ink. I also stamped the bottom of my envelope, overlapping with the help of post it notes, using the open envelope stamp with several of the sentiments that are included with the set. To put my card together I attached fun foam to the back of my panel, then added the vellum piece along with the little carrier, and added the sentiment banner across the bottom. I also stamped another butterfly. 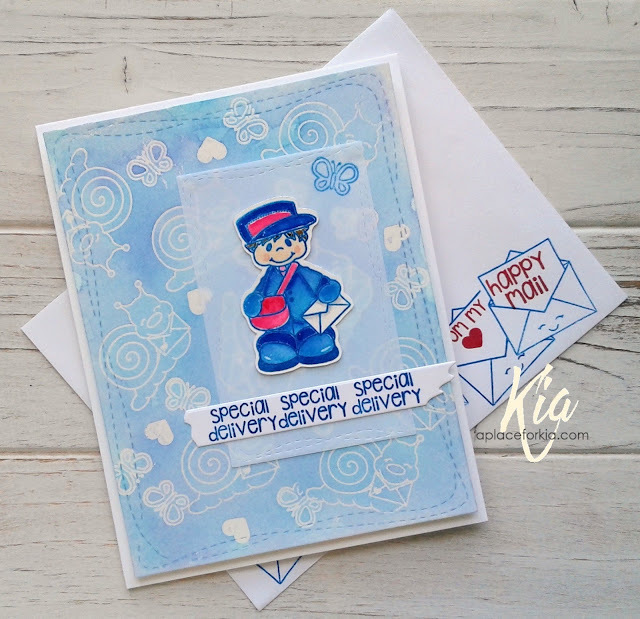 My postal carrier is a great lady who has lugged lots of "stuff" for me, and she always makes sure I get my "fun stuff", so I gave this card to her to give to a young one in her family. On to my second card. 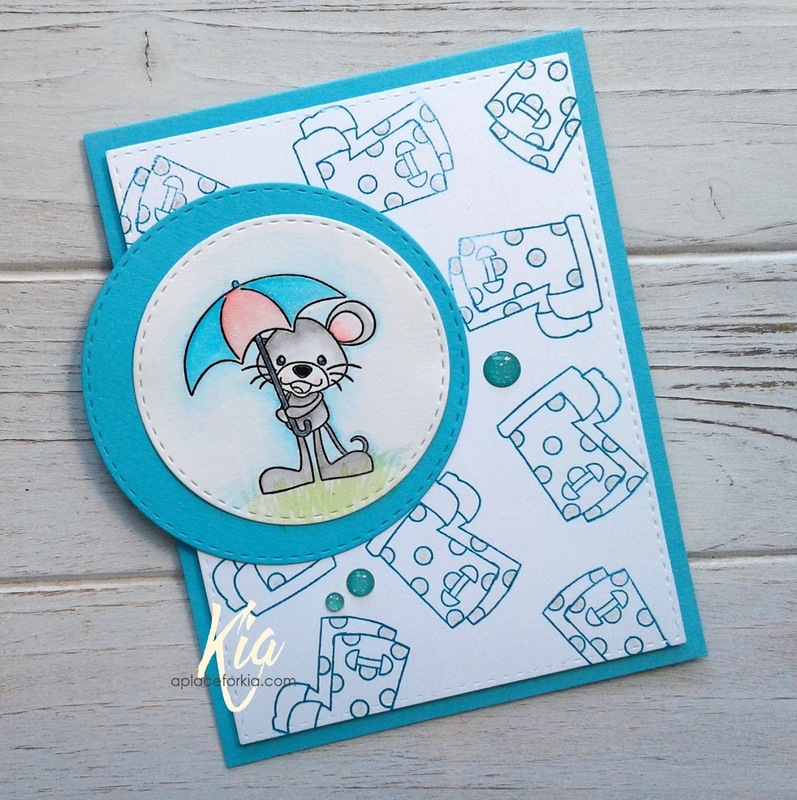 I used my Mini Misti along with the Rain or Shine, Rain Frogs and on the inside I used the little Flower Mouse that was gifted to me by Pink and Main. How thoughtful is that? 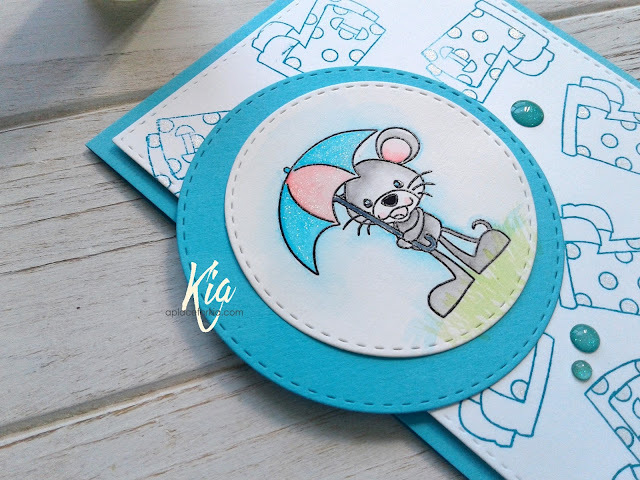 I stamped the Rain or Shine mouse with Ranger Archival Jet Black ink and heat embossed with clear embossing powder, then watercoloured with Zig Brushes. 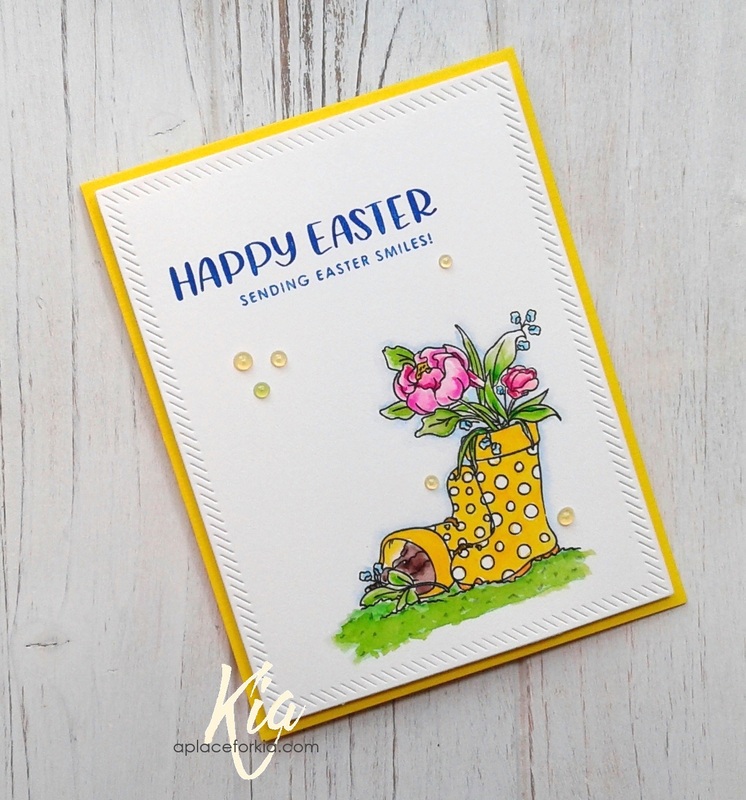 For the background I stamped the boots from the Rain Frogs stamp set using Ranger Archival Inks in Paradise Teal, and added Wink of Stella to the polka dots. The inside was done the same way with the same colours. I have done a video showing the above card. I hope you enjoy today's card and video. 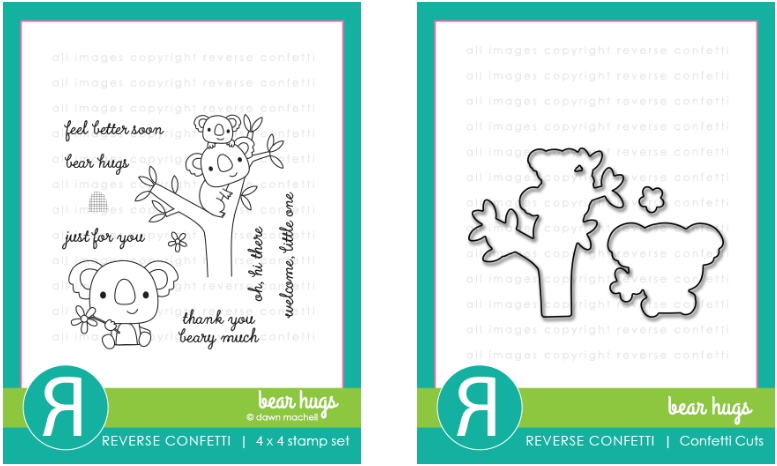 Have fun on the hop and don't forget to leave your comments for a chance to win. Products Used: MISTI Original and Mini, My Sweet Petunia Bar Magnet, My Sweet Petunia Original and Mini Mouse Pads, Pink and Main Rain or Shine, Rain Frogs, Flower Mouse Stamp Sets, Neenah Classic Crest Solar White 110lb Cardstock, Aura 100lb. Cardstock, Fabriano Hot Press 140lb Watercolour Paper, 40lb White Vellum, Zig Brushes Light Gray, Blue Gray, Light Blue, Light Pink, Light Carmine, Carmine Red, Flesh Color, Dark Oatmeal, Yellow and Black, Ranger Archival Inks in Jet Black, Paradise Teal, Vermilion, Manganese Blue, Tim Holtz Distress Inks in Broken China, Salty Ocean, Mermaid Lagoon, Peacock Feathers, Blueprint Sketch and Citron, VersaMark Embossing Ink, Clear Embossing Powder, Frantic Stamper Lables and Strips Die Set, Simon Says Stamp Wonky Rectangles Die Set, Stitched Rectangles and Stitched Circles Die Sets, Fun Foam, Foam Tape, Watercolour Brushes, Wink of Stella, Acrylic Block, YNS Gumdrops. It is time for another hop, and today My Sweet Petunia is hopping with Reverse Confetti. Before I continue I should mention that not only will you see some fabulous cards, we have prizes too. We will choose two lucky commenter's from the hop to win one of two prizes: a $60.00 shopping spree at My Sweet Petunia or a $60.00 shopping spree at Reverse Confetti. 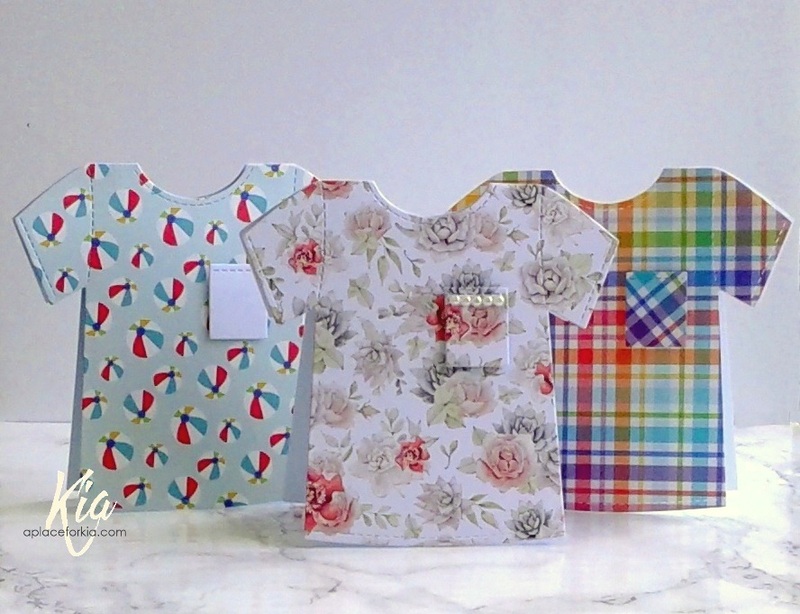 Everyone who comments on all the blog posts will be entered to win. 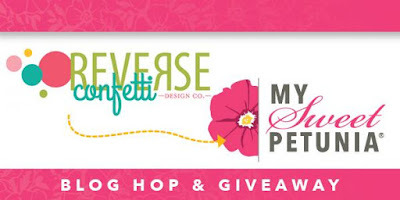 You must leave your comments no later than Sunday, March 25th, at 11:59 PM Central time, and the winners will be announced on Tuesday March 27th, on the Reverse Confetti and My Sweet Petunia blogs. On to my card. 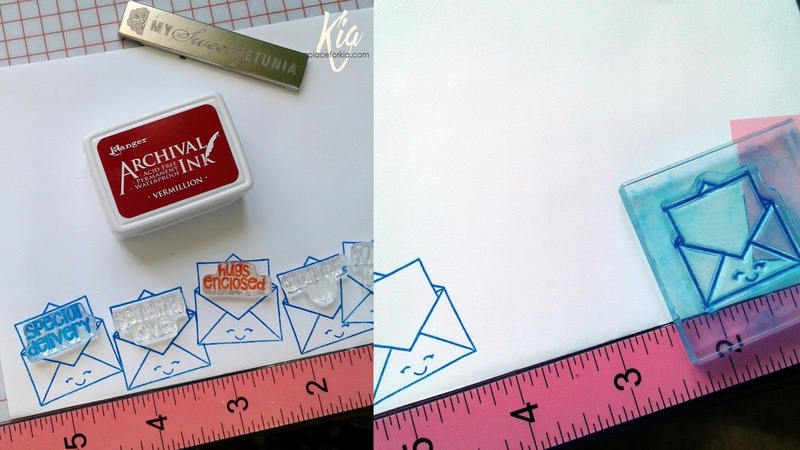 I am using my Mini Misti for this card and the Carton Cuties Stamp and Die Set. I decided I would use the Chickie stamp for my card. 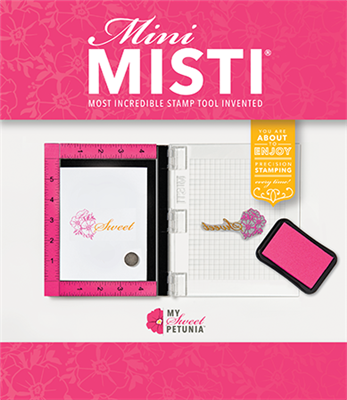 In my Misti I set the stamps up on a piece of left-over card stock, first stamping the egg carton in distress hickory smoke . I then die cut the Chickie and the egg pieces, and die cut them, colouring the egg with yellow and orange markers. The eggs I stamped using archival inks in orange and pink. I wanted a frame for my design, so I die cut the piece from co-ordinating cardstock. 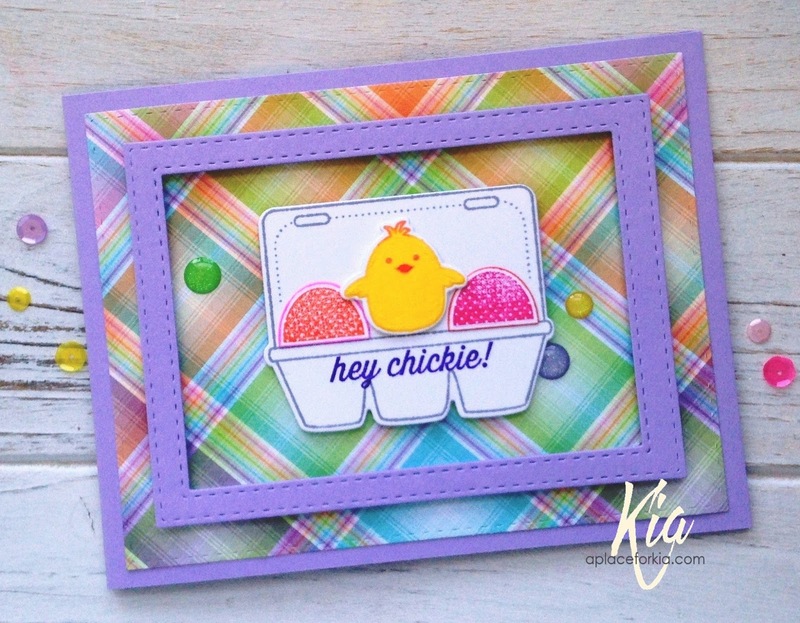 Then continued with the Chickie and egg I wanted for the inside of my card, along with the sentiment piece for the inside, which is the left-over from making the frame. 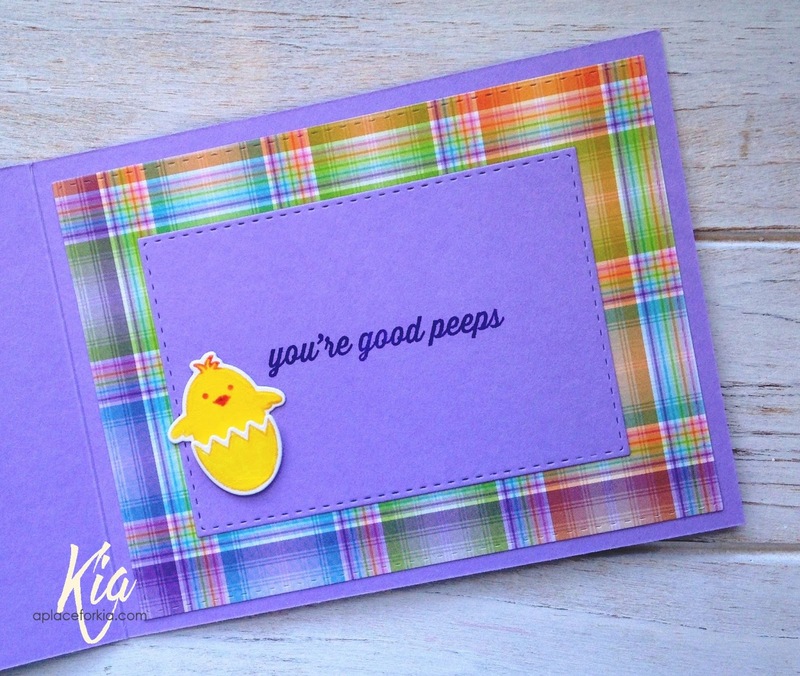 I stamped the sentiment on the egg carton using archival purple ink. This is the inside of my card. I just love the colours. 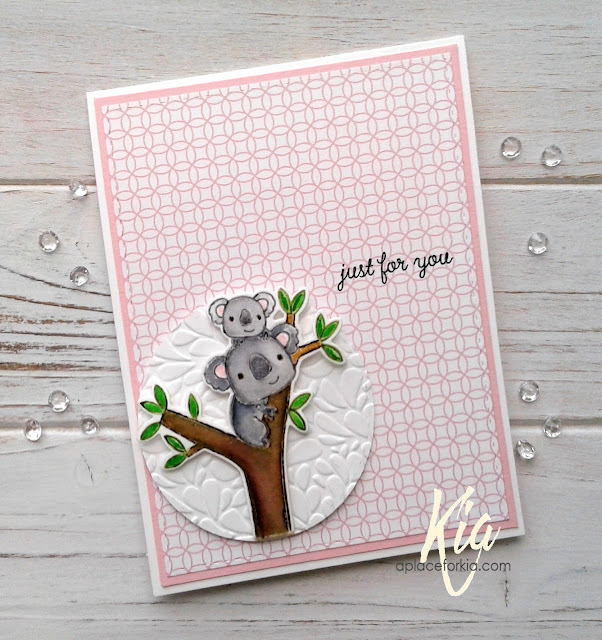 For my second card I used my Original Misti and the Bear Hug Stamp and Die set. I couldn't make up my mind as to the colours of the bears, so I did one in each colour. 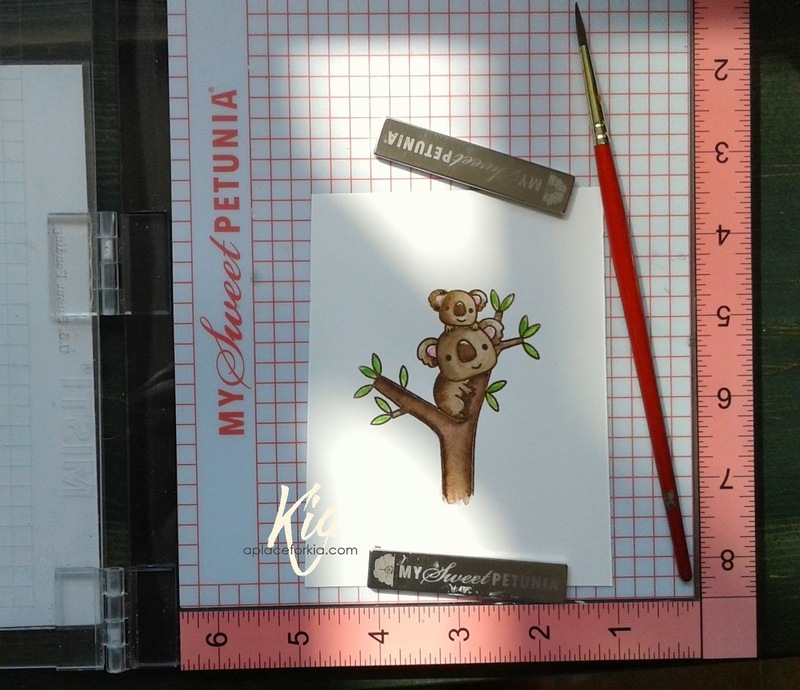 distress markers and Zig brushes to paint this, along with the bear below, which I did for the inside of my card. I decided I liked the grey, so that is what I went with. This is my finished card. I wanted it clean and simple, so I did not even add any sequins!! I did add Wink of Stella to their noses. 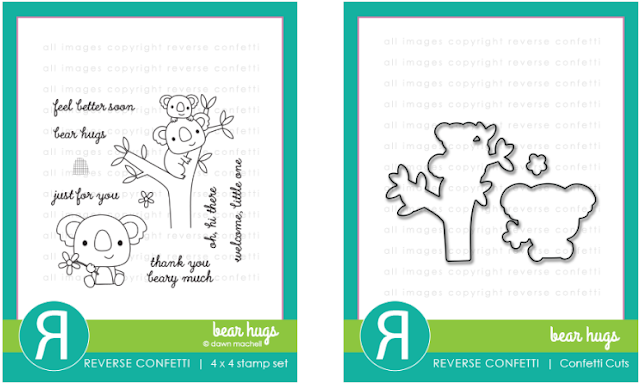 I hope you have enjoyed the cards I made as much as I enjoyed making them. Now on to the rest of the hop. You should have arrived here from Tricia's blog, and the next blog you visit will be Deanne's blog. 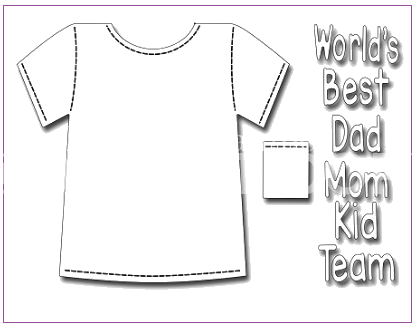 If you are lost, following is a list with links of all who are participating in this hop. Products used: Original and Mini Misti, Reverse Confetti Carton Cuties Stamp and Die Set, Bear Hugs Stamp and Die Set, Aura Cardstock, Reverse Confetti 6x6 Paper Pack True Love, Lawn Fawn Perfectly Plaid, Neenah Cardstock, Fabriano Hot Press Watercolour Paper, doCraft Markers, Ranger Archival Inks Chrome Yellow, Bright Tangelo, Vibrant Fuchsia, Majestic Violet and Jet Black, Tim Holtz Distress Ink Hickory Smoke, VersaMark Embossing Ink, Clear Embossing Powder, Daniel Smith Watercolours, Schmincke Watercolours, Zig Brushes, Distress Markers, Frantic Stamper Labels and Strips Die Set, Stitched Rectangles Dies, Stitched Circle Dies, Elizabeth Crafts Swirly Curves Embossing Folder, Foam Tape, Foam Dots, Wink of Stella, Gumdrops. 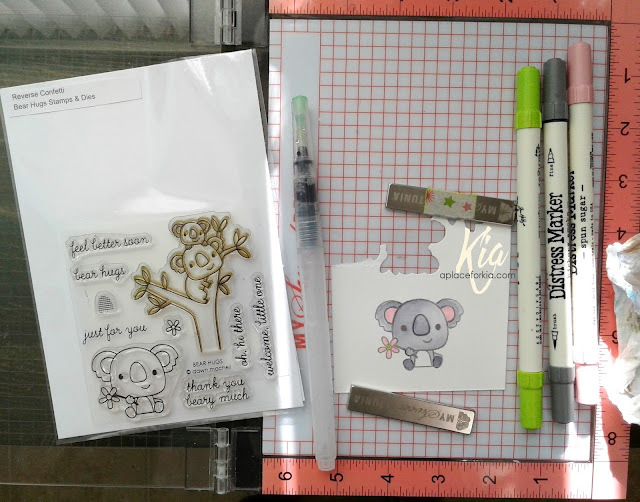 I am having so much fun using these Joy Clair stamps, and today I am back with another card to share with you. As you know from my previous posts, My Sweet Petunia and Joy Clair Stamps are having a month long collaboration, complete with prizes. You can find all the details and the rules in this post. 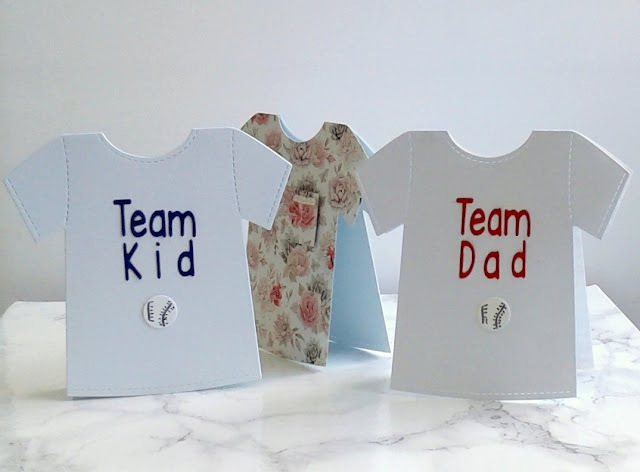 This is such an easy card to make, and fun too. I first die cut the half moon shape using Neenah cardstock, then die cut another larger shape in copper glitter paper. 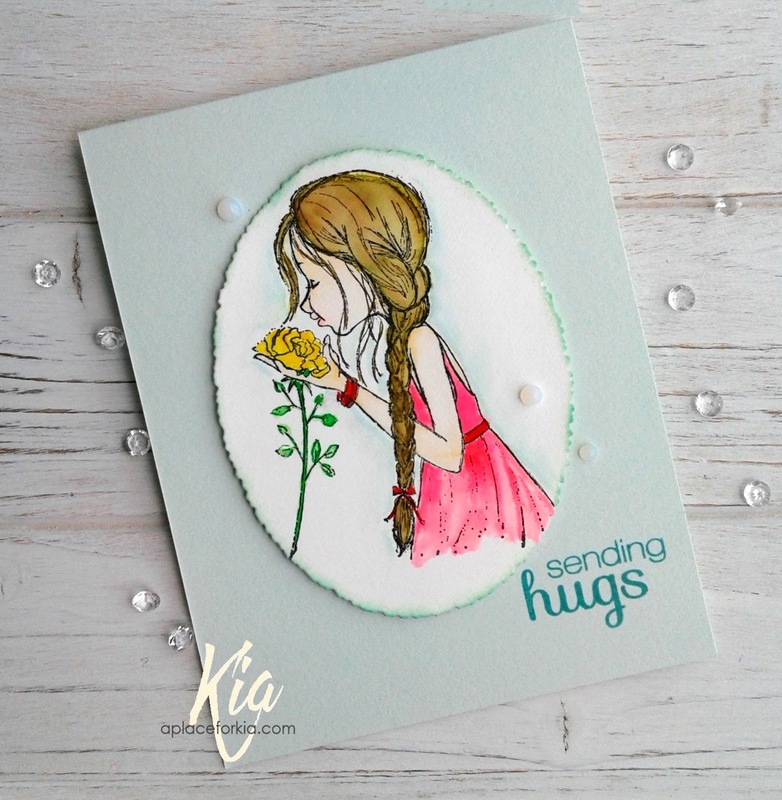 I then stamped the image with versamark ink and heat embossed using Lindy's embossing powder in Midnight Copper, and coloured with Prismacolor coloured pencils. 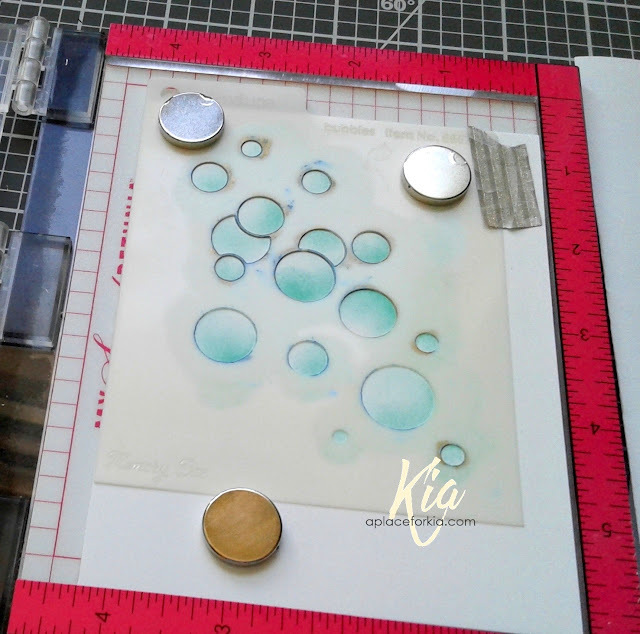 I arranged my stencil on my card base in my Mini Misti and sponged on the Spring Rain colour lifting towards the top of each bubble. A close up of the stencilling. 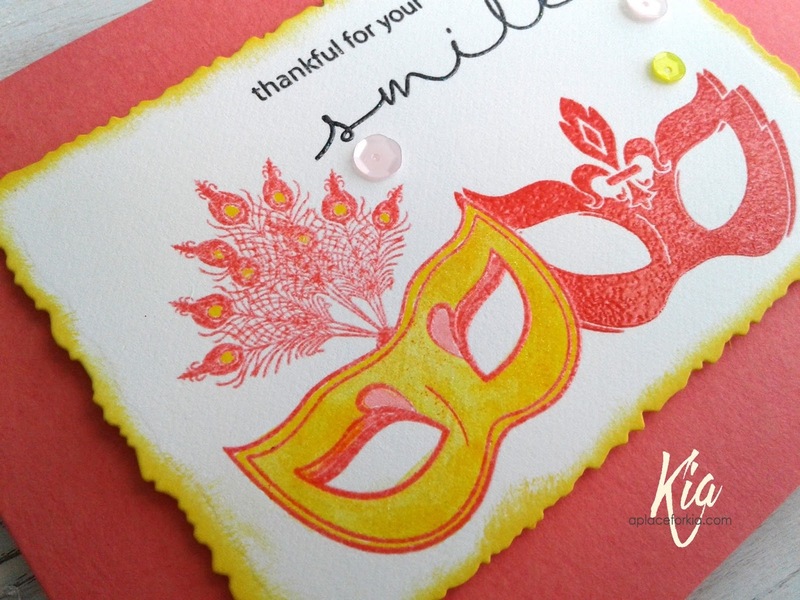 To finish I added the half moon shapes to the card base along with a few small sequins. 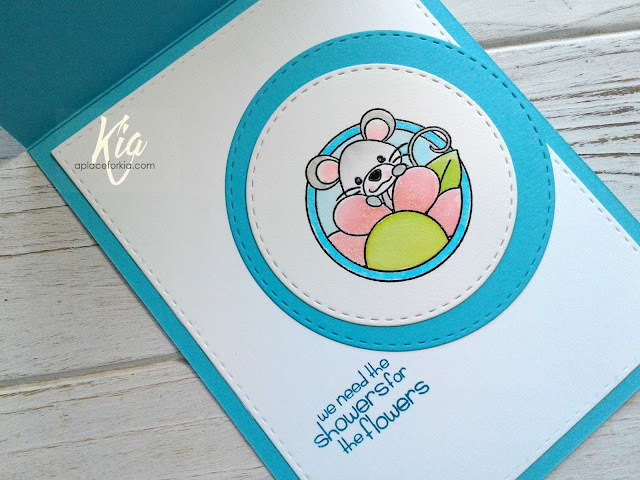 A close up of finished card. 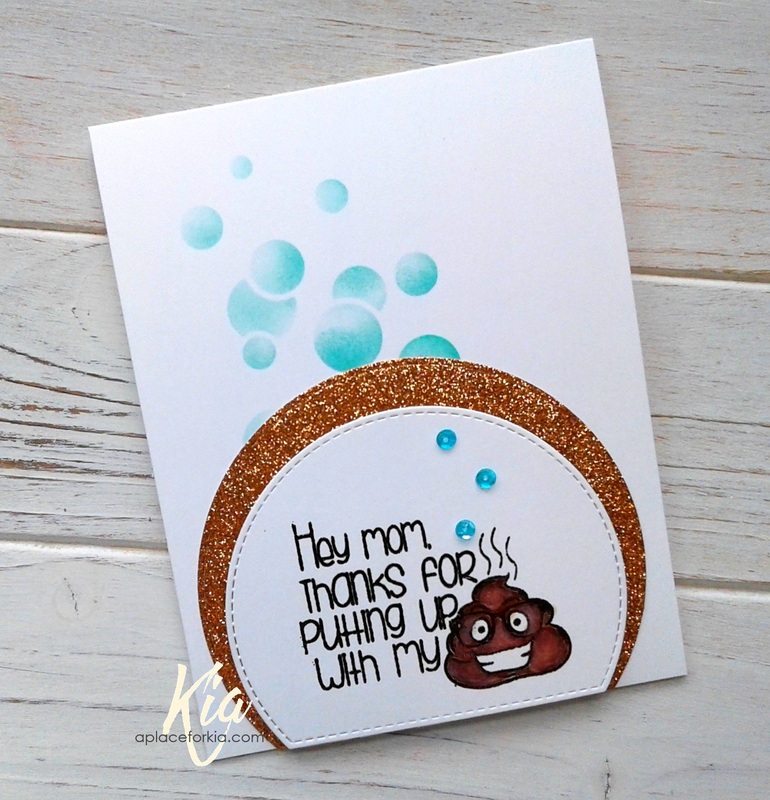 Products Used: My Sweet Petunia Mini Misti, Joy Clair Mother's Day Stamp set, MFT Die-Namics Stitched Arch STAX, Neenah Cardstock, Memory Box Bubbles Stencil, SSS Copper Glitter Paper, SSS Spring Rain Ink, Lindy's Midnight Copper Embossing Powder, VersaMark Embossing Ink, Prismacolor Premiere Coloured Pencils, Sequins. Sharing this card I did for the My Sweet Petunia and Joy Clair collaboration, which continues for the month of March. You can find all the details and the prizes in this post. For my card today I used the stamp set called Mardi Gras, but I used it in a different way than what it was intended for. My good friend Lesley works part-time for The Queen Elizabeth Theatre in Vancouver, B.C. and this stamp set has me thinking of her. When Les smiles or laughs, her eyes light up, and the masks represent her eyes. To start this card, on Neenah cardstock and in my Mini Misti, I arranged the stamps as I wanted them to appear. I first stamped the mask on the left using melon ink, then made a mask of that image to cover the right side, and stamped the image on the right using the same melon ink. I did however make several passes to get a darker colour. 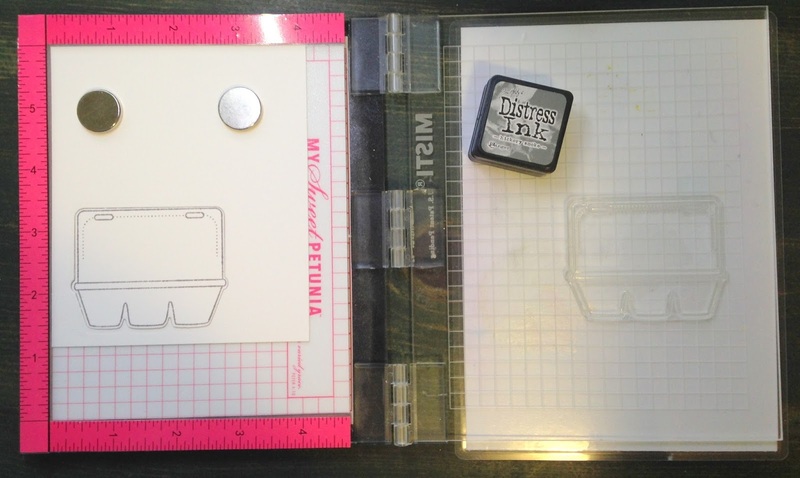 Once the colouring was complete, I stamped the images with embossing ink and heat embossed with clear embossing powder. As the left stamp is an open image, I used a small make-up brush and sponged on the ducking yellow colour. Again, adding several layers to get the deep colour. For the little circles in the feathers I used my Zig brushes. I wanted my sentiment to be in line with my thought process for this card, so I used the stamp sentiments from the Hugs and Smiles stamp set, using Ranger Archival Jet Black ink, then embossing ink and heat embossing with clear embossing powder. 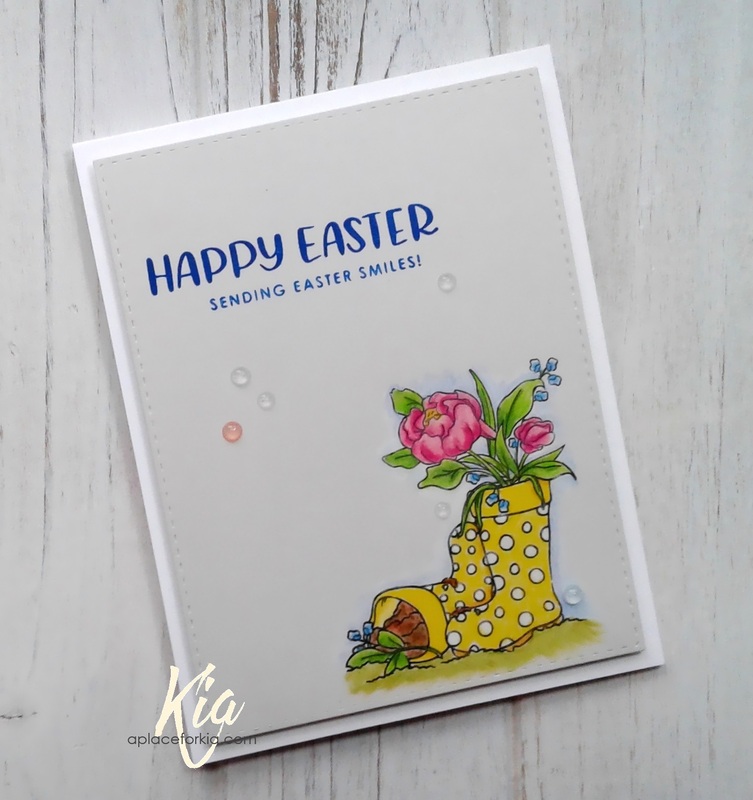 To bring more yellow into the card, I sponged the edges of the panel using the ducking yellow ink, attached the panel to fun foam then to my coral card base. I finished with a few sequins. 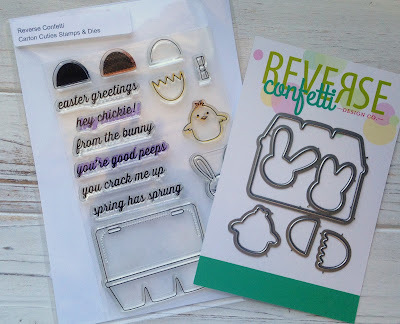 I have to send her Easter card first, so I will send this later in April. 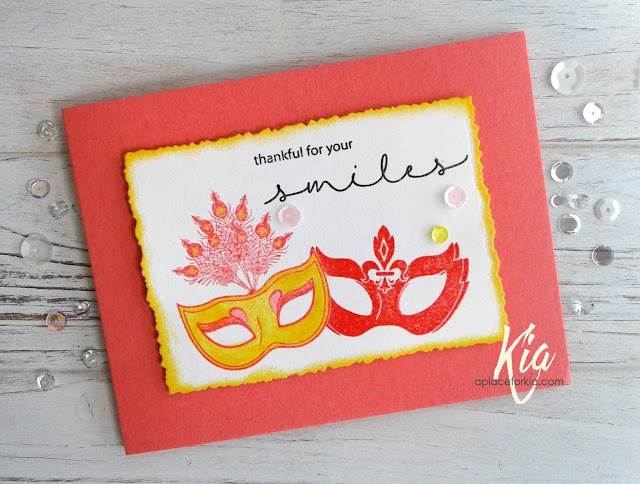 Products Used: Misti, Joy Clair Mardi Gras and Hugs and Smiles Stamp Set, Frantic Stamper Deckled Rectangles Die Set, Neenah Classic Crest Solar White Cardstock, Aura Coral Cardstock, Simon Says Stamp Duckling and Melon Inks, Ranger Archival Jet Black Ink, VersaMark Embossing Ink, Clear Embossing Powder, Fun Foam, Sequins.